Buy Set Wet Style Cool Hold, Vertical Hold, Wet Look Hair Gels - Paraspharma Products. Style your hair, it keeps if stylish for longer. Whether it is your flair for setting the hearts of women on fire or the knack of making their lust boil over, stay in control with the all-new Set Wet Style Cool Hold Hair Gel. If you thought the meeting of fire and ice would be stunning, be a part of the explosion now. New Cool Hold Hair Gel from Set Wet. Celebrates your cool, suave style. It doesn't just style your hair, it keeps if stylish for longer. So fresh, so cool. It makes the girls wanna get all hot with you. Get ready to withstand the pressures of seeing gorgeous women dissolve at the mere glimpse of you with the all-new Set Wet Style Vertical Hold Hair Gel. But, worry not, for you’ll still have the perfect setting to keep you sure footed amongst all the weak kneed women around you. 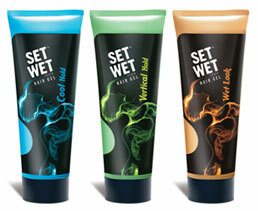 New Vertical Hold Gel from Set Wet raises your style quotient. It doesn't just style your hair, it keeps if stylish for longer. It's spunky. It's wild. It makes girls wanna take their love for you to a higher level. Ever wonder how a lion feels when caught in a wild bush fire? So, stay prepared with the all-new Set Wet Style Wet Look Hair Gel as you will be surrounded by smouldering women every time you hit the floor. The world will be on fire, but you’ll still ride high.